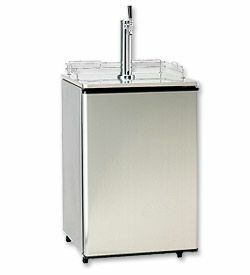 The Summit SBC-500SST Full-Size Kegerator is a portable beer cooler with platinum sides and a sleek fingerprint-resistant stainless steel door. It comes with all the necessary draft beer hardware to tap a fresh keg of beer, including a 5-lb. CO2 tank, regulator and American Sankey "D" system coupler. The unit features a rugged 18 gauge stainless steel top with a chrome draft beer tower and guard rail.